Saturday 3 March. Rosebud Rest Day. Arthur's Seat Ride. Today the weather was hot and humid with temperatures rising to 29C. It was sunny early but cloudier later with scattered thundery showers. The hot northerly wind switched to a much cooler SW wind at the end of the day. I took a bike ride today into the local hills. I had read about hairpin bends up a 1000ft climb to a place known as Arthur's Seat so of course that had to be the route. The hill is above Rosebud and to get to the start of the climb I headed east on the coast road to the outskirts of Dromana , the next town. Being a Saturday there were a lot of roadies out for training rides using the coast road cycle lane. The climb was as advertised with a good few hairpin bends and on one a gradient of 19% registered on my bike computer. There were some good scenic lookouts on the way up. There were good views looking west to Rosebud below with the shallow waters of its beach visible. While I was there the Tasmanian Ferry came by below heading for the narrow straits out of Port Phillip Bay. Although sunny I could see a small thunderstorm passing by on the horizon probably over central Melbourne, 40 miles to the north, at the top end of the bay. There were more viewpoints at the top. I continued down a little and then along a ridge road. When it clouded over I stopped at a handy bus shelter and waited 15 minutes for a thunderstorm to pass over. With the sun out again I continued via Red Hill among wineries and then turned off on a quiet and pleasant byroad which had about 2 miles of gravel and joined the main south coast road I took a few days ago. After a picnic lunch I headed on to Cape Schanck which is a rocky headland with a lighthouse. 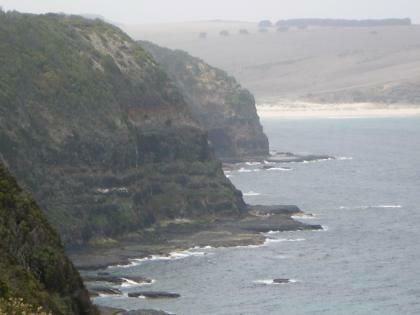 It is on the most southerly point of the peninsula facing the Southern Ocean There were a lot of viewpoints to explore. 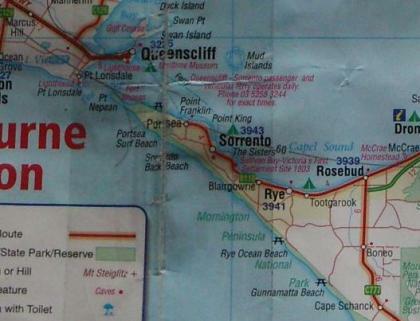 Then back to Rosebud on the north coast with a long gradual descent. 35 miles for the day and 1879ft of climb. Saturday 3 March. Murray's Lookout on Arthur's Seat Road. Friday 2 March. Rosebud Rest Day. After 3 hard days this was totally a rest day with the bike restricted to the Motel Room for the duration. After finding a Computer Shop to get on the Internet I went across to the Beach. At Rosebud the shops and most houses are on the inland side of the coast road with a wide area of park, trees and dunes on the coast side. The result is that the town is well hidden when on the beach which seems a good arrangement. During the morning and early afternoon I sunbathed on the sandy beach. The water is very shallow for a long way out so I paddled and took pictures while out at sea. Later in the afternoon I walked along to the pier. Today I had time to fiddle with my digital camera and found a function for the first time of adding digital filters such as colour casts. Another filter is to posterize the image which produces some interesting effects. 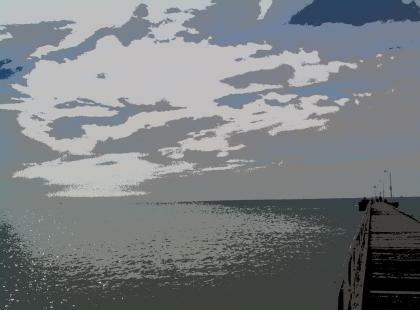 See the picture below of the sea and pier. These sorts of effects can readily be added later on a computer but it is useful to try them out in the Camera. 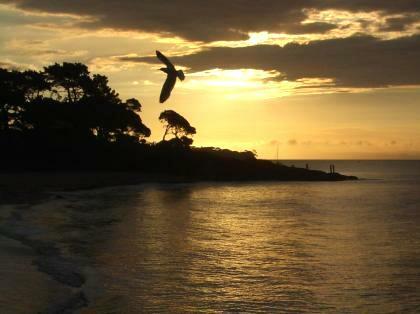 Weather today was mainly sunny with some cloud about especially in the morning and temperatures rising to 24C. 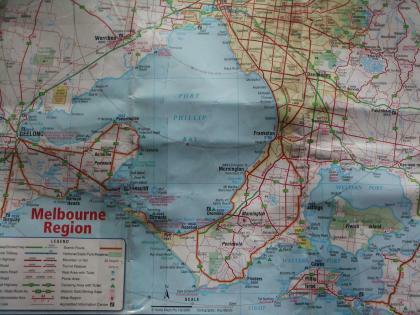 Today's ride started with a ferry trip across to the Mornington Peninsular. 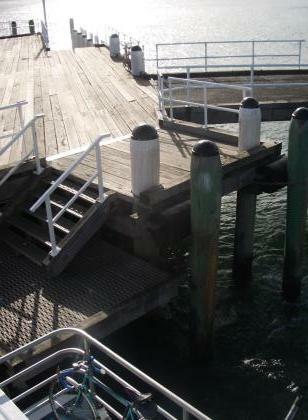 I had stayed overnight at Cowes on Philip Island which is at the bottom end of the Western Port Bay. 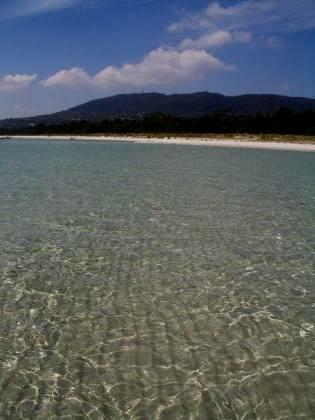 The Mornington Peninsula is the land between this bay and the much larger Port Philip Bay to the west at the top end of which Melbourne is located. 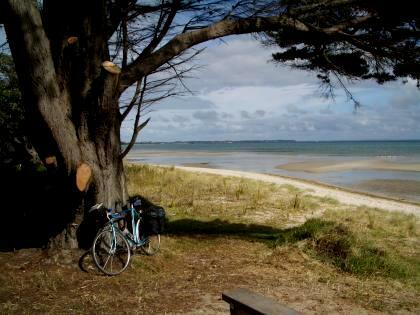 Philip Island has many similarities with the Isle of Wight. It is a diamond shape, the main town is Cowes and it also has a Ventnor. It has a rock at its western end called the Needles. Not to be outdone the Mornington Peninsula has Hastings, Shoreham, Rye and Portsea. I caught the 9.10 ferry as there are only 2 sometimes 3 a day. This was a small catamaran passenger ferry which stopped first at French Island in the middle of the Bay and then on to Stony Point on Mornington Peninsula. 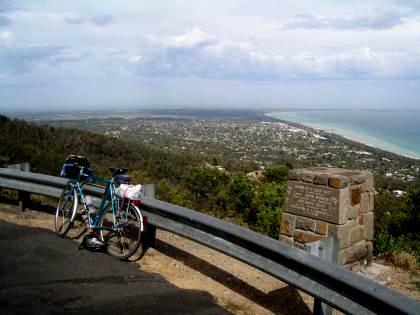 The bottom end of the suburbs of Melbourne curving down Port Philip Bay are less than 20 miles away so nowhere on the Mornington Peninsula is very quiet. However I found some backroads and lots of hills in the middle of the peninsula and took a ridge route along the middle on the Red Hill Road. I then came down to Shoreham Beach on the south coast for a picnic lunch. There is no town, just a shrubby beach but it did have views across to Philip Island and the Needles. 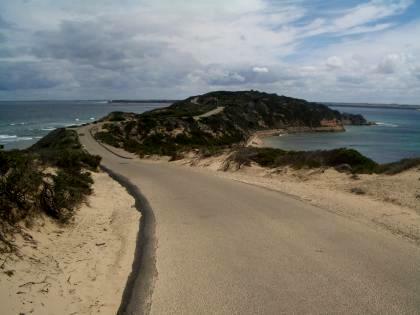 Then the coast road via Flinders with many ups and downs as the route crossed valleys before a long downhill to Rosebud on the north coast where I will stay 3 nights. Rosebud has advantages as a base including being close to the hilly scenic areas and a very good long beach. It is however a fairly characterless town being ribbon development USA style. After dinner I took some pictures of the sunset on the beach. 40 miles for the day and 2358ft of climb. Thursday 1 March. Sunset at Rosebud. Weather today was mainly sunny with scattered clouds and temperatures getting to 27C. The full distance today would have been 100 miles with some busy roads so I decided to shorten it by 30 miles by getting the V. Line train to Warragul. The train passed through the town of Moe which we visited a few weeks ago. 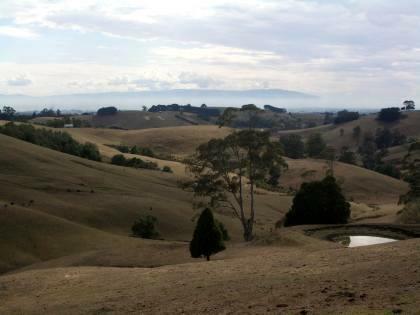 The route was seriously hilly with a long climb out of the valley where Warragul, Traralgon and other towns are situated. This valley is bounded by the Alps to the north and this range of hills to the south called I think the Ocean Range. There are no river valleys across so it was a lot of ups and downs for nearly 40 miles to cross the hills. Greatest height was about 1000ft and I stopped at that point for a snack from my supplies at 11.00. There were great views across the hills back towards the valley and the Alps in the far distance. See picture below. I continued to the town of Korumburra where I stopped in a park for a picnic lunch. As the hills started to run out I could see the sea and Venus Bay in the distance. Then on to the village of Dayston near the coast for an afternoon chocolate milk stop at a store. I joined the coast road which was much busier than the roads so far but had a wide hard shoulder. My destination of Cowes is on Philip Island at the entrance to a Bay which is to the east of the bigger bay on which Melbourne is built. There is a short bridge over the straights to the Island with the first town being Newhaven. 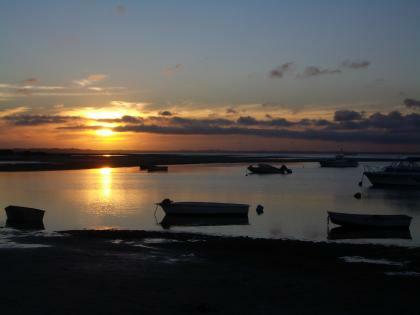 In the evening I took some pictures from the jetty of the sunset. 70 miles for the day and 3664ft of climb. Weather today was cloudy all day with some light rain for an hour about midday and then continuous heavy rain from 4.00 for the rest of the day and evening. At least it was warm rain with temperatures reaching 24C. Wind was generally a SE tailwind. Today was specially notable for the wildlife and can be summed up as follows. 4 Kangaroos a hopping, 1 echidna a scurrying, 20 Cockatoos a screeching 30 cattle a stampeding and 18 Emu a running!! I left early and took back streets through town beside the lake. I spotted 4 Kangaroo which quickly hopped off into the bush. I took the only route into town back along the spit of land between sea and lake down to Golden Beach and a stop for a break. The next 15 miles to Seaspray continued along 90 mile beach with the occasional overlook but mainly between scrubby trees with the constant sound of surf. 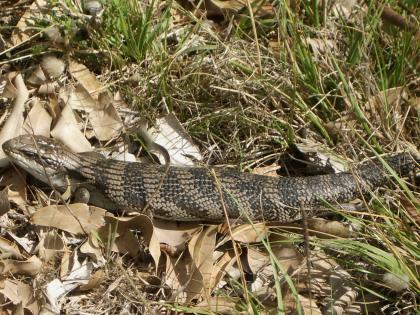 There were a lot of entrances to camp sites and at one an echidna (spiny anteater thingy) scurried across. It was the first time I had glanced the things legs and head. All other times we have seen it the only part visible has been the spines. It was well hidden in brush by the time I stopped the bike. On this road traffic averaged a car every 10 minutes. At Seaspray I stopped for an early lunch at the shop/caf?. Then on to an even quieter road, a single width byroad to Shadbroke with one car an hour. At one point about 30 bullocks and cows were grazing the wide grass verges as sometimes happens in Australia. One started running away from me and then it was a mass stampede and it looked to be difficult getting past. However the farmer and his dogs came along and I was able to get past them. When the road reached the main road the map showed a road straight ahead to Rosedale which turned out not to exist. I decided to take the byroad on the other side of the valley which I knew to be gravelled for part of the way. The route was exceptionally quiet with about 2 cars an hour. White Cockatoos were the only noise screeching in their trees. I came round a bend and saw a flock of 12 Emu in a field. They spotted me and ran off at speed over the brow of a hill. Later I saw another 6 which also fled. After joining a main road at Gormandale I rode north to Traralgon. 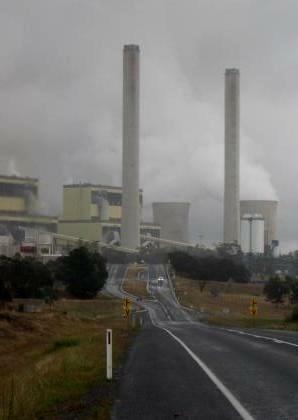 The road went through the middle of the gigantic Latrobe Valley Power Station with enormous humming generators and 6 cooling towers. 91 miles for the day and 1673 feet of climb.